When building a roof, the installation of a truss system is considered to be the most crucial and difficult step. Roof maintenance is associated with constant and periodic loads in the form of snow or gusts of wind. To figure out how to make a truss system with your own hands, you need to decide on its components. 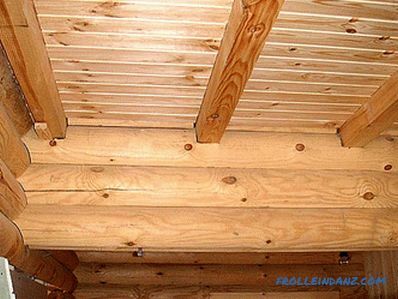 The rafter frame is used for any type of roof, it differs by the level of complexity during installation. Shed and gable roofs are considered simple structures. 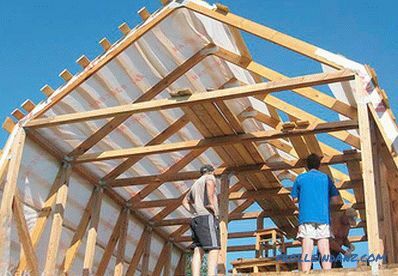 Hip or hip roofs provide a reliable roof, but are difficult to calculate and install rafters. When choosing the size of the material for the frame, many factors have to be taken into account. The cross section of the rafters and the supporting base must withstand the weight of the roof, the climatic loads, the weight of the devices installed on the roof (if any will be installed). 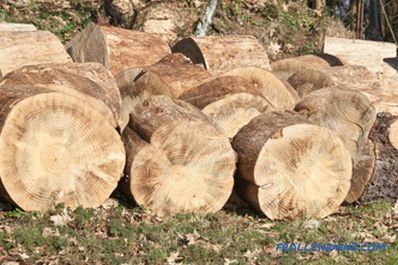 Mauerlat is a timber of considerable size 150 * 150 mm or 200 * 200 mm, which is laid and fixed along the perimeter of the walls. 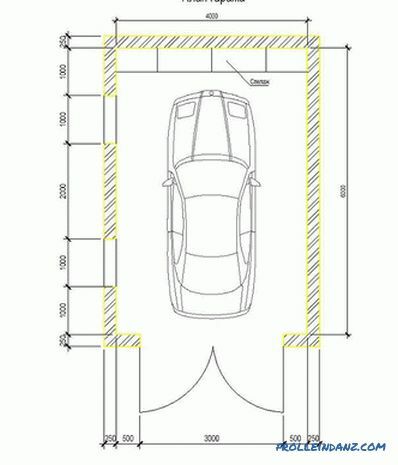 It connects the roof system and the structure of the building into a general structure, distributes the load exerted on the walls. The ridge is the highest point of the roof at which the rafter legs are connected. The longitudinal beam helps to keep the structure, provides stability under wind loads. 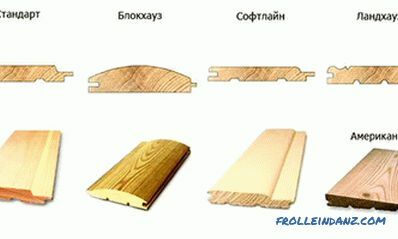 Rafters - are made of a board with a section of 70 * 150 mm, they account for the entire load. From the boards, trussed legs are created, which are mounted in increments of at least 60 cm. Legnen - a bar parallel to the ridge. Its dimensions are equal to the power plate. Lent is a support for racks and other elements. Tightening - the crossbar of the boards connecting the rafter foot. Racks - bars, installed vertically, they are installed to support the ridge run. Overhangs are parts of the rafters that extend beyond the wall. They allow you to divert precipitation from the house. Struts - serve to strengthen the rafters, allow you to create durable structures. Crate - boards required for tying rafters and laying roofing material. 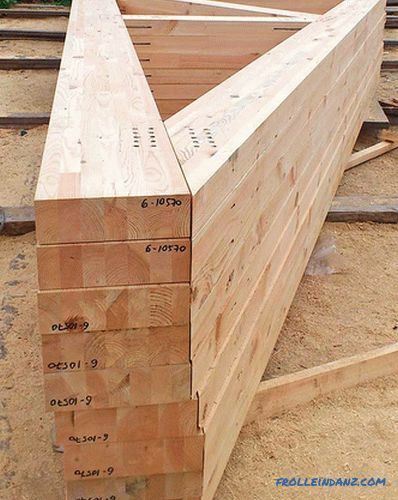 Fillets - when the length of the rafters is not enough for the overhang, fill additional boards "filly". 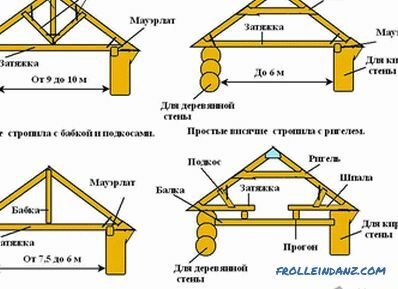 For gable roof frame devices use several types of roof systems. Suspended - the choice of this design implies the presence of a support in the form of a wall in the center of the building. They receive three points of support and are subjected to bending only. The upper part of the truss foot rests on the girder, and the lower part on the mauerlat. 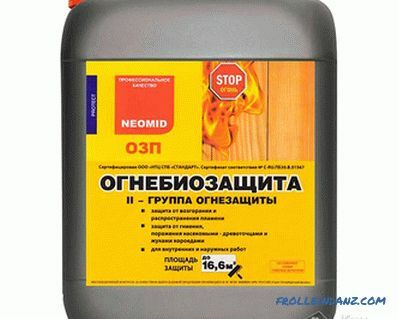 This system allows you to use thinner lumber, reduce costs and carry out the construction of less weight. Hanging - rafter legs are supported only on the walls, therefore they are under great load. To give strength connect by tightening. Such rafters are usually collected at the bottom and served directly for installation. Complex roof shapes require non-standard solutions; they use combinations of hanging and wall rafters. When a four-slope roof is installed, the main framework is the diagonal rafters connecting the ridge girder and the corners of the building. They are supported by ladders - short trusses, which together with ordinary side rafters form the basis of the roof slope. The service life of the truss depends on quality of lumber and its processing. 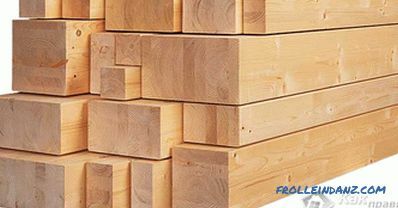 For structural elements it is necessary to select dry wood, with a moisture level below 22%. It should be smooth and knotless. Before installation, all parts are treated with two layers of antiseptic and means that prevent burning. When processing it is worth using a brush, but not a spray, then the composition is better absorbed. When choosing lumber, coniferous wood is preferred. 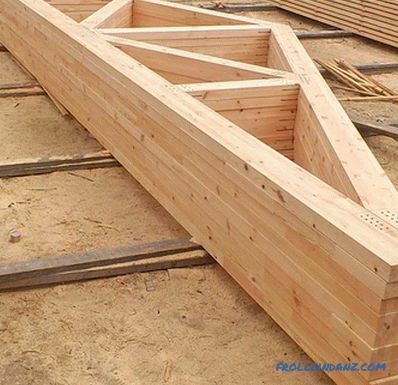 The stability of the structure will ensure proper installation of the truss system with its by hands. To connect the rafters use different types of fastening: staples, nails, shaped steel parts - angles and platinum, which are fastened with screws. 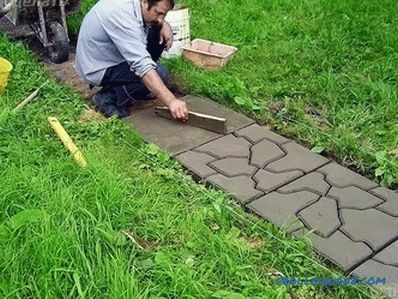 the angle of the slope and the fixing step feet. Permanent load is calculated from the total weight of the roofing material, insulation and waterproofing. With increasing distance between the rafters, a larger section material is required.The coefficient of wind and snow load necessarily laid in the calculation of the cross section. 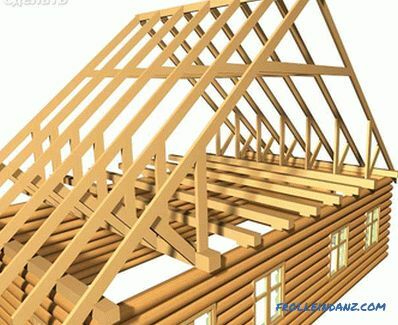 The common size of rafters is 50 * 150 mm and 60 * 200 mm. Base symmetrical gable the roof is an isosceles triangle. Knowing the height of the ridge, you can calculate the length of the rafter by the Pythagorean theorem. In this case, it is a hypotenuse, and half the width of the lady and the height of the roof - the legs. The first step in installing a truss system for Any kind of roof, is the installation and fastening of the Mauerlat. Under it must fit waterproofing in the form of roofing material. This timber requires the drilling of holes along the length, into which the studs bricked into the masonry are inserted and twisted with a nut. Having created the basis for the frame, they make a template according to which they are assembled on the ground all rafter legs for hanging system. To create a sample take two thin boards of equal length rafters and fasten at the ends with a nail. This workpiece is set to the width of the girder, and the resulting angle is fixed by pieces of the board. A second template is used to mark the mounting jigs at the top and bottom of the rafters. Its basis is plywood. When collecting your legs, you need to strictly follow the pattern so that you do not have to redo the structure. The upper part of the rafters is connected with a wooden or metal plate. 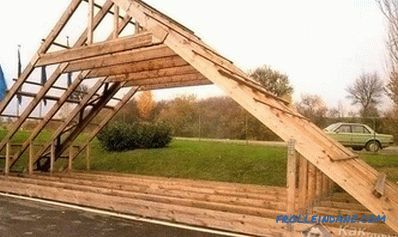 If the assembled roof trusses have significant weight, you will have to use equipment or lifting accessories. The first pair of rafters are mounted on opposite gables. It is fixed by temporary struts and exhibited by level. 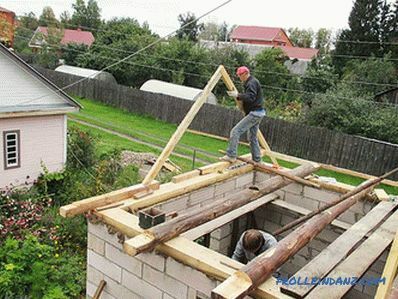 A cord is drawn between the legs as a guideline for installing the remaining trusses. The design is connected by bolts, struts and supports. With a small span, the rafters are not held together with a ridge girder. A roof with a width of more than five meters requires strengthening the structure with a ridge beam. This timber is fastened both under the rafters and above them. Connection occurs with gash and plates. With a large length of rafters, support posts are installed to prevent sagging. The completion of the installation of the truss system will be the fastening of the lath. To know how to properly perform the truss structure, you can watch a video telling about the stages of work.